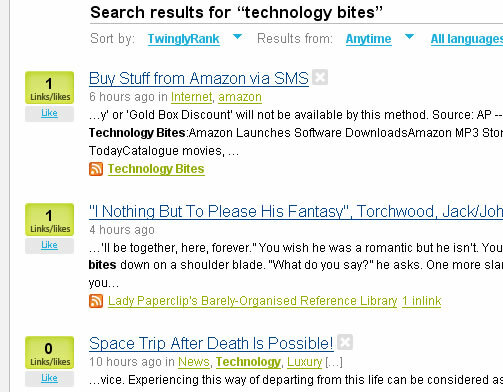 Twingly is a new blog search engine currently in private beta. What is unique about twingly over others like Technorati or Google Blog Search is that twingly claims they are 99.99% spam free. That sounds interesting, becoz both Technorati and Google Blog Search have the spam problem, particularly Technorati counts all the spam blogs. I was playing twingly today, twingly search works like any other search engine, in the search results page you will see digg like “Vote” buttons, users can vote on the results so they will get some higher ranking in the results i guess. It also assigns a rank to the results called Twingly Rank something like Technorati Authority. As it is a new search engine don’t expect relevancy and other stuff yet. Twingly has a screensaver which shows blog posts in a world map as they are posted. You might wonder how does Twingly can be spam free, well what they do is they don’t add each and every blog to their index instead they started from some trustworthy blogs, they follow the links these blogs have given to other blogs and so they will crawl blogs. Hoping that good blogs will never link to spam blogs, of course this is an interesting approach and it just works that way. It will be interesting to see for how long they will be spam free. Thanks for the info, it will be interesting to see how Twingly does compared to the big boys. Hi! Thanks for mentioning us and for the good response! About the spam-free approach we will continue making tools for keeping us spam-free. For now, it’s work pretty well, but in the future we think other tools must be implemented. That’s also why we have an open tech plan so the users (you!) can vote and suggest new features and tools that we can develop. What a great idea! I hate digging through all that spam to find blogs that interest me! Good work!